Short rib is by far the most amazing ingredient to cook sous-vide. One person's cheap, fatty cut of meat is another's delicious and cost effective cut. The last one I made was done using a short rib, removed from the bone, some roasted garlic powder, salt, pepper and some thyme. 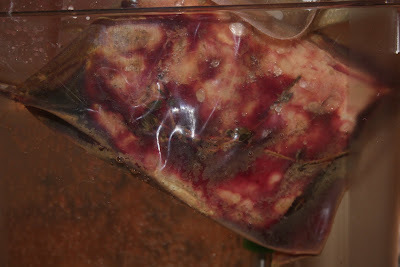 Dropped into the FreshMealsMagic controlled water bath set at 136F and then left to slowly cook over a period of 72 hours. Sous vide genuinely lets us do something magical here. We can break down the chewy fats that are typically broken down by braising, while maintaining the rareness of the meat. This is because collagen (our chewy enemy) will actually break down at lower temperatures, if we give it enough time. I have done this a couple of times and there is no doubt that 72 hours is a HUGE improvement over 48 hours. 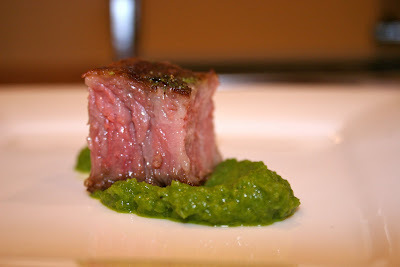 For our obligatory money shot, Here we can see a morsel of short rib, seared in a hot pan, with a roasted poblano puree.